attributed to Greek artists of North Italy. In the fifth century, Rome was sacked by Visigoths and Vandals, and threatened by Huns; it was conquered finally in AD 476 by Odoacer, a barbarian from a Germanic tribe. The eastern portion of the Roman Empire remained free from invasion, however, and its culture continued. Europe, on the other hand, faced very troubled times. By the ninth century, Latin was being lost as a unifying common language and literacy had declined greatly. Greek and Roman culture was almost forgotten. Small kingdoms and tribes fought to control their territories and the Church tried to hold on to its power and influence. During these unstable times, monasteries were places where literature, knowledge and Christian history was preserved. They were centers of learning. In the eighth century, Charles I – a Frank known as Charlemagne – fought numerous wars, formed an empire, and was determined to re-establish literacy and culture among his people. Art played a key role in the renaissance he had in mind. 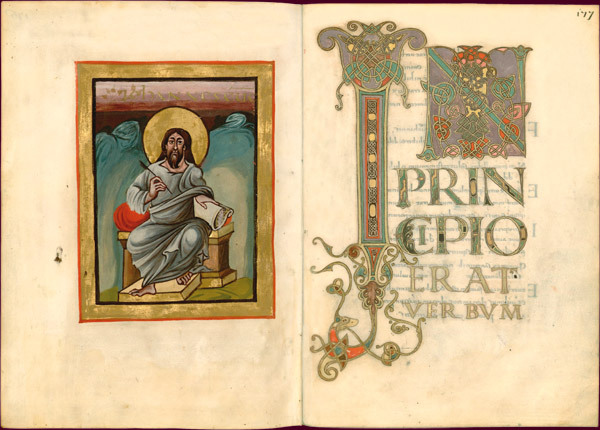 Under Charlemagne, copying and originating illuminated manuscripts was a priority and at the monastery in Reims, under Archbishop Ebbo’s direction, gospel books such as “Saint John” were made. The portrait of John depicted at the front of his book shows him looking out at the viewer; his seated position is a much repeated pose copied from Byzantine sources. Although a quill and scroll are being held to indicate he is the writer of the gospel that bears his name, an eagle, the animal associated with him and included usually as an identifying feature, is missing. The Latin text starts with the very large decorative first letter “I” and to its right the letter “N.” The letter “N” also is large but almost hidden beneath its embellishment. Though spaced apart, the two letters spell the word “IN” which begins the introductory words of John’s Gospel; “IN PRINCIPIO ERAT VERBUM” (“In the beginning was the word”). The lacy designs, vines, and animal decorative work of the middle ages are not from Greek or Roman sources but the result of the assimilation of images brought into Europe by barbarian tribes. Making books at a monastery required a team of artists with specialized skills; these included not only calligraphers and painters but also people who prepared vellum, ground pigment, mixed inks, and bound books, Often goldsmiths were employed to create a book’s cover and embellish it with precious jewels. The city of Byzantium was founded by Greeks in the fifth century BC and named after their king, Byzas. When the Roman Emperor Constantine moved his capital east to Byzantium in AD 330, the city was renamed Constantinople (now called Istanbul). The eastern portion of the Roman Empire was not called the “Byzantine Empire” during its time. Historians of the sixteenth century were responsible for that designation.